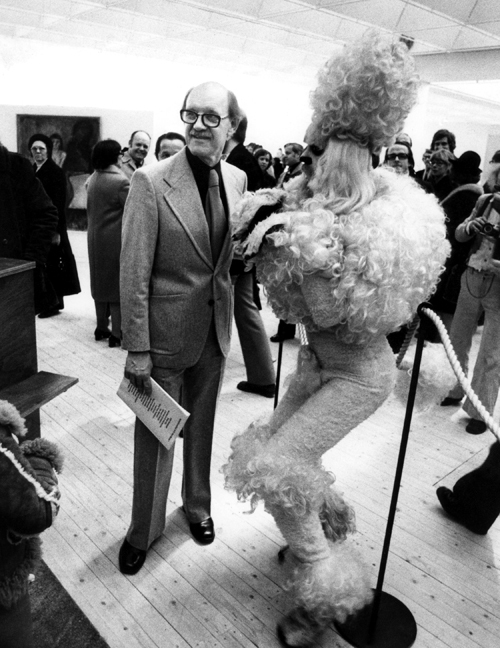 In 1976, the Norwegian/Swedish artist Kjartan Slettemark dressed up in a white poodle costume and walked around the opening of Malmö Konsthall. Upon the arrival of the museum director, he went to attack, biting and growling but also wagging his tail and trying to please. As a pet that not yet had accepted the quiet restrictions of its existence, he categorically went for people with a dominant influence over the local art scene. I lived in Malmö then, that is the town where I grew up. I was somehow interested in art but had a strong feeling that there must be more to it than what I saw around me. I read about the performance in the daily newspaper and laughed, “Lapdog of the Bourgeoisie” – what a great work! I took the final decision to become an artist. Kjartan was an exceptional artist – brave, anarchistic, political, funny and a great source of inspiration for many artists. I made a performance inspired by his poodle, but that is another story. The first time I actually met him was back in 1998 in a remote railway station in Luxemburg. We were both on our way to the same show and were kind of lost in the middle of nowhere. I think that I embarrassed him, as I was so over the moon to finally meet him after all these years. We had some contact through the years after that; I have a piece by him made by a trashed Coca-Cola can remodelled into a flower. When the travelling group show “Lapdogs of the Bourgeoisie” happened in Tensta Konsthall in Stockholm I contacted Kjartan asking him to bring his lapdog to life again. He loved the idea but the costume was purchased by Moderna Museet so we had to make him a new outfit. This new costume should have given Kjartan the possibility to bring the poodle to life again and again but unfortunately he left us shortly after this performance. I so wish that he had stayed longer in this world. Miscellaneous / Annika Eriksson / A Lapdog, NOT!